New York’s top doc, Dr. Jacono is considered one of the best rhinoplasty surgeons in the world. Frequently sought after to lecture on his rhinoplasty techniques, Dr. Jacono also realizes that not every nose needs to be fixed through surgical means. Therefore, he also offers a non-surgical rhinoplasty procedure for patients who are looking to improve their nasal appearance without surgery. Non-surgical rhinoplasties are performed using a combination of injectable fillers and botulinum toxin to help restore symmetry to your nose and overall facial harmony. Dr. Jacono uses precision and controlled injections to achieve proper nasal proportions so the nose fits within the facial frame. Dr. Jacono uses Radiesse® which is a facial filler to help correct the shape of the nose. He chooses to use Radiesse® because it is made up of calcium crystals that are like the minerals already found in the bones of the nose, and the results it also lasts up to two years longer than other fillers such as Restylane and Juvederm do. While the results from this non-surgical procedure are immediate and typically last up to two years, it is not a permanent solution and does have limitations. Non-Surgical Rhinoplasty Patient 2: Unhappy with her nasal bump and her drooping nasal tip but not wanting surgery to correct the issues, this female patient opted to have Dr. Jacono perform a non-surgical nose job at his Long Island office. 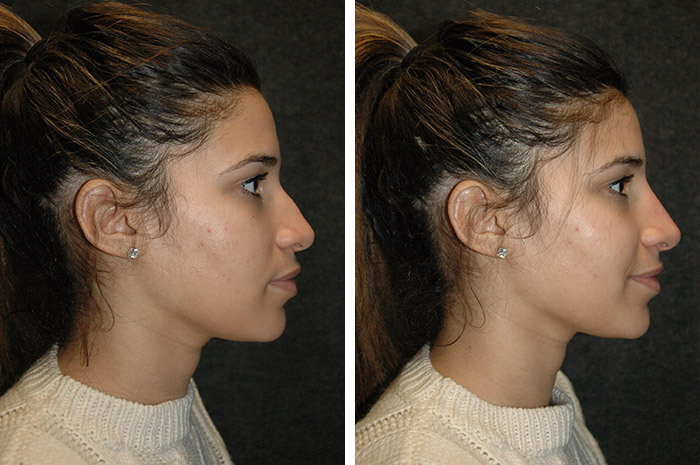 You can see in the after photo that he reduced her bump, as well as, lifting and redefining her nasal tip. Dr. Jacono knows that there are many ways to use fillers to reshape the nose. One of the most common techniques he uses is to inject the dermal filler to decrease the appearance of bumps. This is accomplished by injecting into the bridge of the nose just above the bump which makes the nasal bridge appear to be straighter. While it does improve the bridge straight, it cannot decrease the size of the bridge or create a soft feminine curve in the bridge that is sought after by many women. To make the nose smaller and have that curve, Dr. Jacono would need to perform a rhinoplasty surgery. For patients that have a flat nose, Dr. Jacono will inject the filler to help create a nasal bridge that originally was flat. This procedure is extremely popular with Dr. Jacono’s Asian and African American patients because the results from this technique are often like those seen from rhinoplasty surgery. The main difference between the two is that the surgical option is permanent and does not require reoccurring treatments like a non-surgical rhinoplasty does. Non-Surgical Rhinoplasty Patient 3: This female patient was unhappy with her nasal hump. She chose to have Dr. Jacono perform a non-surgical rhinoplasty procedure to correct the hump as well as to lift and redefine her nasal tip. 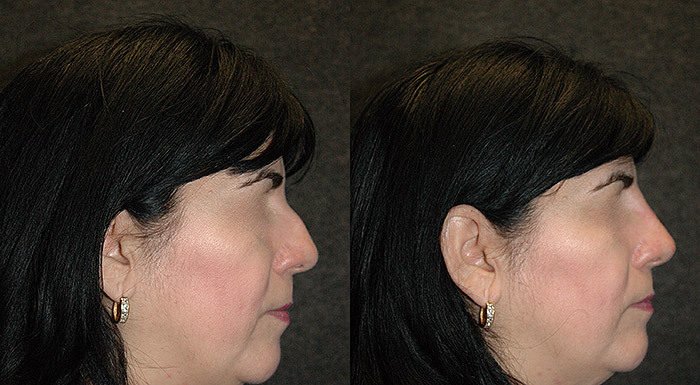 Her after photo was taken 5 minutes post procedure and shows a flat dorsal bridge with a slightly lifted and redefined nasal tip. Dr. Jacono also uses the fillers to further reshape the nose by filling in dents, hollows, and indentations. This is a technique that can be employed to help correct irregularities that some patients may have experienced from a prior rhinoplasty procedure with another doctor. This non-surgical approach is a great alternative to a more complex revision rhinoplasty procedure when the irregularities are minor and only small refinements are needed. 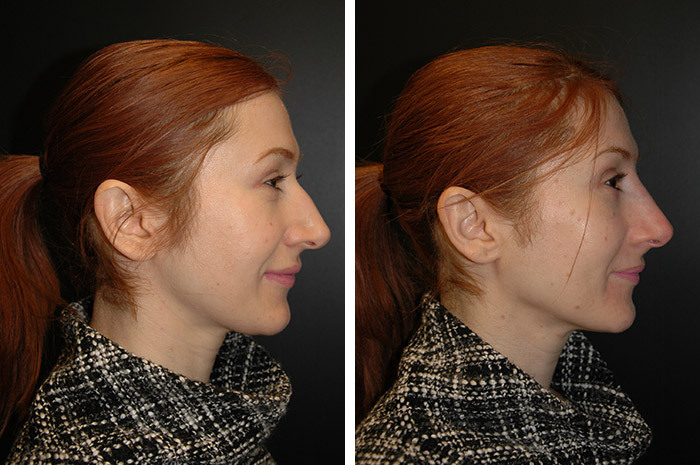 A non-surgical rhinoplasty is also a great way to address a droopy nasal tip. Patients with a droopy nose can have their nasal tip lifted using botulinum toxin to help create a more upturned nose. This is accomplished by injecting the botulinum toxin directly between the nostril to help release the depressor septi muscle which causes the nasal tip to droop. Using facial fillers combined with the botulinum toxin will deliver the best results. However, these results are temporary and patients seeking a permanent solution should consider speaking to Dr. Jacono about a rhinoplasty procedure. Patients who are in generally good health and looking to correct minor imperfections to their nose without surgery could be a good candidate. During your consultation, Dr. Jacono will be able to evaluate your nasal shape and your goals to determine if this procedure option is right for you. To learn more about non-surgical rhinoplasty procedures or to schedule your consultation with Dr. Jacono, call our office at 516-773-2424 today.